If you’re looking for an awesome gift for the cat lover in your life, look no farther than Shop Cats of New York. Disclosure: I received a free copy of Shop Cats of New York for the purposes of this review. The opinions expressed here are my own, and Paws and Effect only shares review of products we think would interest our audience. 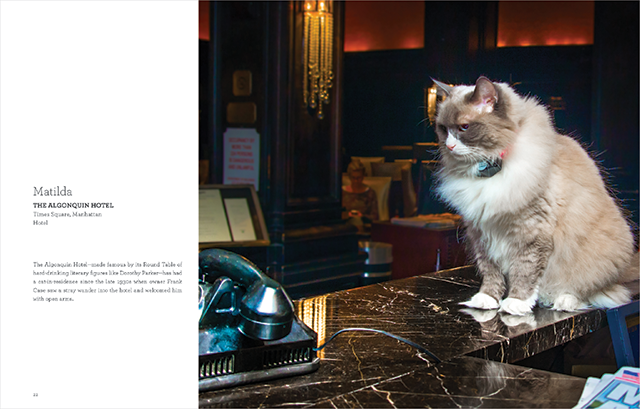 This book, written by Tamar Arslanian of the blog I Have Cat and photographed by Andrew Marttila, is worthy of being a New York City tour guidebook. If you want to know about 36 of the coolest shops in New York, look no further. 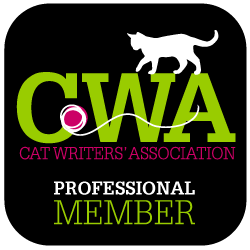 From the world-famous Matilda the Algonquin Cat to “spell-casting” cats in occult stores to pest catchers in distilleries, this book has it all. The bios of each cat featured are easy to read and just as entertaining as the cats themselves, while the photos capture the true personality of each of the feline subjects of this book. Bobo graces the counters and shelves of specialty grocer Japan Market in Manhattan’s Chinatown. I particularly loved reading the story of Keetah, a gray cat with a white locket who lives at Bleecker Street Records in Manhattan’s West Village. Customers come as often to love on Keetah as they do to flip through the vinyl record albums. Bleecker Street Records is one of the last old-school record stores in New York City, and Keetah serves as the store’s mascot. She even has her likeness printed on the store’s T-shirts. 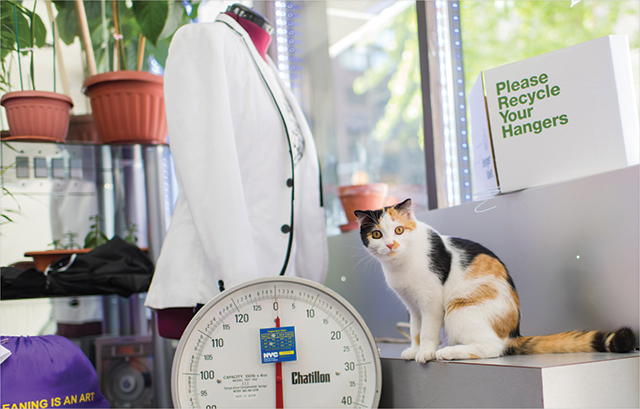 Calico girl Bud is the mascot of Chenille Cleaners in Manhattan’s Midtown West neighborhood. Then there are Eros, Medea, and Zero, who protect and serve the customers at Enchantments, an occult store in Manhattan’s East Village. Senior manager Stacy says she believes cats bring positive energy with them, and that witches and cats just naturally go together. Stacy says that some evenings, Medea likes to “cast spells”: sometimes she grabs a wand and starts running around the store, mewing at the top of her lungs. 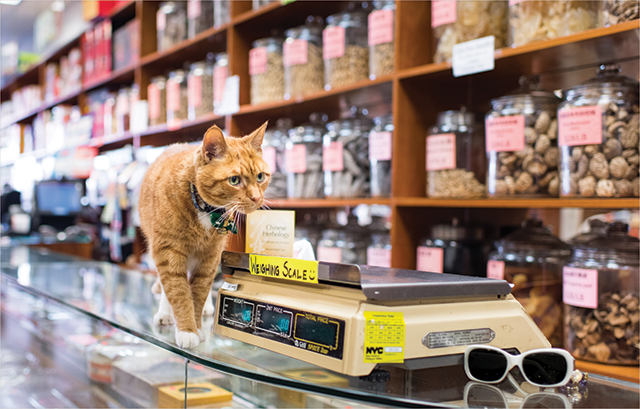 Read this book and you’ll know that shop cats in New York grace more than just corner bodegas; they live at bookstores, courier service offices, colleges, and so much more. 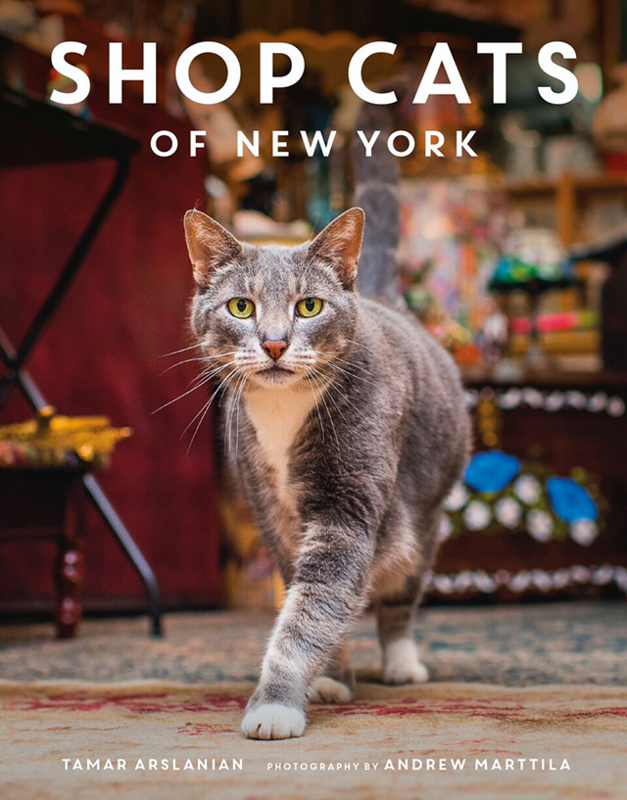 Shop Cats of New York is a fantastic holiday gift for the cat lover in your life. Get your copy today. It’s available online and at bookstores.